To an average passerby, the scene is typical of most late-night haunts: Men and women, grabbing a slice of pizza, most likely after a night out. But upon closer inspection, something much more interesting transpired. The language is English, but the accents are diverse – some hailing from the deep south to others clearly spoken by a non-native speaker. Others are wearing kippas and tallit (skullcap and Jewish prayer shawl, respectively), while others have tattoos on their arms and wear a crucifix around their neck. But they are all engaging in a deep conversation about not only their differences, but their commonalities. There, a group of pastors from all over the world broke (cheesy) bread with other young Jewish men and women where they both discovered much about each other and broke down the many barriers that often come between those hailing from different religions and nationalities. 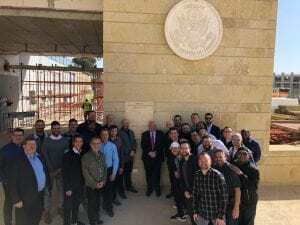 The pastors were part of a 30-person delegation who arrived to Israel last week courtesy of Eagles’ Wings – an organization dedicated to building bridges between Christians and Jews and strengthening the bond Evangelical Christians have with the Holy Land. “What we find is that the parents and grandparents of these guys all came to Israel. It was a given. But we find that it’s not a given in this generation,” the organization’s Founder and Executive Director, Robert Stearns lamented. Stearns, who has brought more than 25,000 Christians to Israel since the 90’s, chose these group of young men not just for their youth, but their influence. Mesa alone, preaches to a congregation of 12,000 and has 17,500 followers on Instagram. His take on Israel, then, is not just his own – when he and the 29 others share their unfiltered perspective on Israel at the pulpit or their virtual platform, the potential to change hearts and minds is infinite. “I feel privileged to be able to tell these stories and use my influence. People think I look like their neighbor, or someone they know, so they want to listen to what I have to say. That why I’ve taken on the responsibility to tell the story of Israel. This is our job,” Mesa, said. Among Eagles’ Wings pastors that means, holding Celebrate Israel events back home and engaging with their local Jewish community to understand how this relationship can be a two-way street. Sometimes, however, especially for those who have never been to Israel before, that friendship is not always obvious or easy to forge. “I think it’s sad when I find a pastor who is in his late 60’s and they’re retired, kids are out of college and they finally tackle Israel as an item on their bucket list. How sad that they missed 30 years of preaching opportunity to be really engaged with Israel – the Israel that is not just a museum, but a living, thriving, home of the Jewish people,” Stearns said of the all-inclusive trip, which is fully sponsored by Eagles’ Wings. That journey goes beyond visiting popular holy sites like the Western Wall, by setting up meetings with the Israeli political and diplomatic leadership, like US Ambassador to Israel David Friedman, and, like the aforementioned impromptu pizza-summit above, everyday Israelis. While in Israel pastors are often overcome by the spiritual, emotional and physical experience in Israel, that they often coordinate a return visit for their congregants. Specifically, roughly 40% of the pastors who visited Israel through Eagles’ Wings have initiated a return trip, Stearns said. Mesa is doing just that, with his third trip to Israel already in the planning stages. This time, he will come with members of his congregation and his wife. His relationship with Israel is a deeply personal that Mesa chose to ignore for much of his life. A descendant of Spanish-Jewish immigrants, as a young boy, Mesa grew up proud of his Jewish heritage. But after suffering antisemitic bullying at school, eventually the Star of David around his neck and the Israeli flag adoring his walls came off and his connection to the land he loved so much was severed. He credits Stearns and Eagles’ Wings for helping reignite that passion. He now feels it is a flame that will never be extinguished and hopes his infant son and young congregants will continue keeping the love for Israel alive in the next generation.